This listing is for an E-Pattern to print yourself at home on your home printer's USA letter and A4 sized paper. This "Resto-Vival" pattern dates to about 1937 for nautical inspired slacks that lace up with eyelets at the inside center front waist and are held up at the outside with large buttons and a belt that passes through a bound buttonhole. This pattern also includes a cute halter top with a wide collar and a bolero jacket! The slacks can be made in two different lengths. This pattern includes cutting charts for modern 45" and 60" fabric widths. Note that vintage instructions may be difficult for the modern sewer to comprehend. Please read below for more information on "Resto-Vival" patterns. If you are between sizes order the next size larger, as my patterns have less ease than modern standards. Please order pattern by measurements (given in inches), as the size numbers do not equate to modern pattern sizing and pattern sizing can vary from pattern to pattern on my website. Resto-Vival™ Patterns are original historic patterns that have been restored and revived. Original patterns are usually available only in single sizes, precut from tissue paper and totally unprinted, with details like grainlines and darts indicated only by small perforations. Resto-Vival™ patterns are clearly marked with drawn and labeled markings. These markings aid the modern sewer in understanding the markings of the original pattern and the construction of the garment. Resto-Vival™ patterns follow the period shapes of the original patterns, maintaining the historical accuracy of the completed garment. Original period instructions are included. These instructions are text only (unless otherwise noted) and fairly minimal, especially compared to instructions for modern patterns. At least an intermediate knowledge of dressmaking and a good familiarity with pattern construction is suggested. 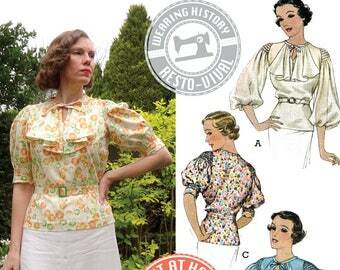 You may choose to have a modern or period sewing book handy to help with basic construction methods that the pattern instructions do not cover in detail. Also, fitting a muslin mockup is strongly recommended, as all garments were meant to be worn over period foundation garments or corsetry. This pattern is tiled into letter sized paper. You will print these documents on your home printer, cut, and tape them together, to form a larger pattern layout. Then you cut and use your pattern just as you would a normal home sewing pattern. 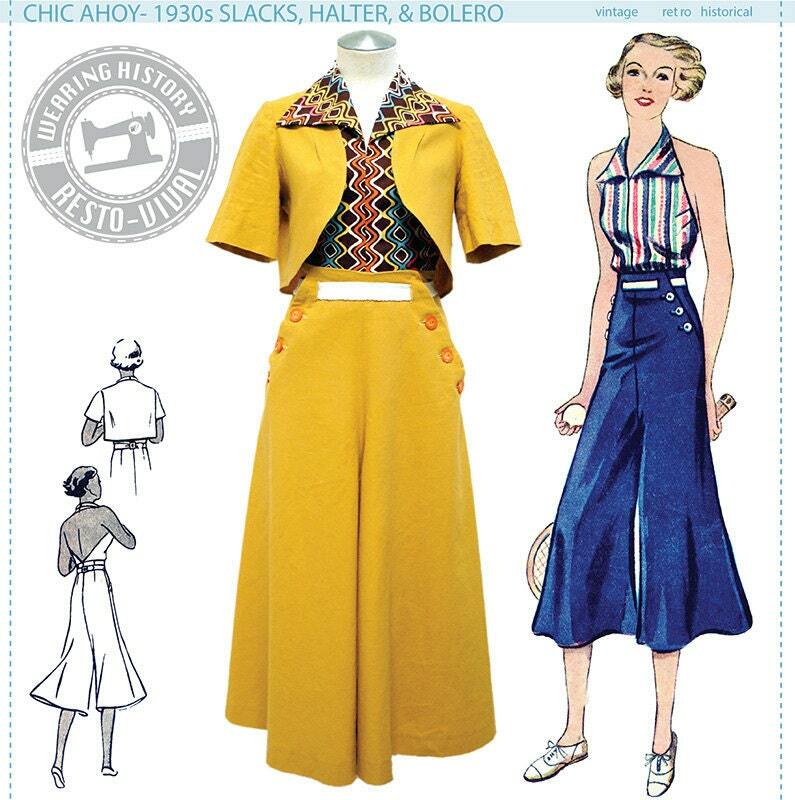 This pattern uses 25 sheets of paper for the slacks pattern, 15 pieces for the halter and bolero pattern, 8 for the instruction pack, 1 for the e-pattern "how to" sheet. 49 total sheets of 8.5" x 11" sized paper or A4 sized paper are needed. This pattern file is formatted to fit on both sizes of paper, and there will be varying thicknesses of white border, which will be cut off, according to pattern instructions. Please view my other items by visiting my store, and read my shop policies prior to ordering. Thanks! Lauren of Wearing History is a literal goddess. This pattern is by far the easiest and most explanatory e-pattern I’ve used. I’m almost done with the slacks and it’s turning out great so far. The perfect last-minute solution to a sewing crisis! The pattern was easy to print and assemble and clearly labeled, thanks for saving my outfit plans!